I've only been building vintage bikes for a couple of years and in the back of my mind I've always had a soft spot for the Pashley Guv'nor. I knew it existed, I knew I wanted one, I knew it looked great, but initially I couldn't justify the expense. At first I tried and tried to resist the temptation.....until eventually.....I gave in and bought a Guv'nor 3 speed! The Guv'nor appeals to me on many levels, but mainly because it captures the essence and charm of old world cycling and incorporates the three things I love about vintage bikes......steel, rubber, and leather. The Guv'nor has a traditional steel frame design (made from Reynolds 531 tubing) with classical Westwood rims, and runs on Sturmey Archer hubs and gears. I love Sturmey Archer equipment, it's always reliable, stylish, and easy to maintain. The white Schwalbe tyres capture the essence of a "1930's path racer" and the addition of a Brooks saddle is a great finishing touch. I mention the "1930's path racer" because it is marketed by Pashley in this form and truely is a good reflection of a bicycle from that period. At this stage I must say that this is a great bike that rides beautifully. The design and thought that has gone into the model is grand and the price point, in my opinion, is really good value for money....great job Pashley!! I got my new Guv'nor and rode it for about 100kms or so through the streets of Perth, Western Australia. Comfortable, cruisy, and always turns a few heads. Every time I hopped on it, however, I couldn't help but wonder about the stem and handlebar setup. The stem is a Japanese made Nitto Technomic stem......great bit of kit but with a 1990's look, and the handlebars were an inverted North Road style (moustache) handlebar that, although reminiscent of the period, was not a true "path racer" handlebar. This setup works, is functional, and nice to look at, but I don't think it gives the bike the true style and beauty that it deserves. I did a bit of research and discovered the "Lauterwasser" path racer handlebar from the 1930's. A good looking steel bar, more racey than the relaxed moustache style bar, that offered more hand placement options when riding. These bars were named after Jack "Lauterwasser" who was an English long distance racing cyclist and cycling engineer, who won a bronze and silver medal at the 1928 Summer Olympics in Amsterdam. I was keen to get a set and try it on the bike - "google" his name if you must. 1947 Humber with "Lauterwasser" handlebars. I must say that the "Lauterwasser" handlabars have only been recently produced by Soma and that they were not available to Pashley when Guv'nors were first introduced to the market in 2008. I got a set of steel Soma "Lauterwasser" handlebars through http://www.renehersestore.com/ - who were a great help and happy to ship to Perth, Western Australia, at a reasonable cost - it's always hard to find good service but there are exceptions! I also located a Reynolds branded alloy stem and gave it a good polish with marine grade aluminium paste. A "Reynolds" branded stem was a good addition here; Pashley had gone to a lot of trouble sourcing Reynolds 531 tubing for their Guv'nors, and the two were made for each other! Reynolds stem, 25.4mm clamp, 22.2mm quill, 80mm length. Soma "Lauterwasser" bars and the Reynolds stem. Here is an image of the bars partially fitted.....it was really hard to take the beloved Guv'nor apart, not physically hard, but heart wrenching. It was like tearing a limb off one of my children.... and I hope I never have to do it again!! .....and other images of the new handlebars and stem fitted on the bike. Lauterwasser markings on the bars...nice touch Soma! ...there's the city of Perth in the background, a great place to live all year 'round! ..probably the best image of the bars, just wonderful! The bars offer more hand positions than the original inverted North Road bars. These bars won't suit every Guv'nor owner..... but they may be an option for a Guv'nor owner who just wants something a little different. The original specced Guv'nor really is triumphant, but if you're going to tour a little more on your Guv'nor and would like more hand placement options, then these bars might be for you. The beauty of them is that they are in keeping with the period that the Guv'nor has captured, and in my opinion, they look just great! Soma do make an aluminium version of the "Lauterwasser" handlebars as well, although the steel option is stiffer and is a correct material for the period. If you are thinking about getting some of these bars you'll certainly need a shorter stem. The Nitto stem that comes on the bike is quite long but you need this length to accomodate the flatter inverted North Road bars. The "Lauterwasser" has a longer reach and this should be offest by a shorter stem. Perhaps the next Guv'nor model will have the option of having these bars fitted when ordering.....keep cycling and be safe. 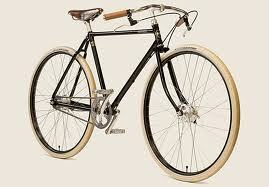 i am the perth distributer for pashley bikes i too love them . Those bars have a wonderful shape. I'll bet that bike turns some heads!